So why should your furniture fit the mold? Your space, whether home or place of business, is a reflection of your personality and purpose. Adorn that space with something that aesthetically inspires while functionally supporting your purpose. “Your home should tell the story of who you are and be a collection of what you love." I'm the founder and lead designer at Timber & Tulip. I love creating things that make my clients smile and do everything in my power to make the process not only easy but fun! Our design process is aimed at creating a client experience that feels personalized, creative and professional. From original design mockup to final reveal, we will work together to make sure that your custom creation comes to life just as you imagined it. Get Your FREE DESIGN CONSULT SCHEDULED TODAY! After taking a peek at our portfolio and blog, you’re convinced we’re officially style twins. I’ll cheers to that! Designing a piece that’s true-to-you starts with scheduling a time to meet us! Schedule a one-on-one showroom visit or initial phone consultation using our easy on-line scheduling tool. To get started, all I need you to tell me is when you'd like to start! Click here to schedule. After our initial discussion, if you have decided that you would like to move forward, it is time to nail down final design specs, features and cost to create, which we will walkthrough with you in detail and ensure no stone unturned. And once you are ready (and excited!!) to get started, we’ll make it official with a signed contract and deposit (50% at time of order). And then the real magic happens! Now that we’ve finalized our design, we're off to the races! We take a hands-on approach with everything happening behind-the-scenes, ensuring our vision and timeline stays on course, reaching out to you on an as needed basis should any questions or points of clarification come up mid-fabrication. But rest assured, we partner with the best local fabricators to build the highest quality custom furniture right here in the Twin Cities, which ensures you will have a piece of furniture that is as sturdy as it is beautiful. Locally designed, locally built, locally enjoyed. And then it is time for the big reveal! We personally deliver finished product for all local orders, making sure that your new piece of furniture is beautifully setup in its new home and that you are fully satisfied - preferably with a big smile on your face! A rewarding close to a fun and fulfilling process, CHEERS! "We highly recommend Timber and Tulip! Brianne exceeded our expectations as she was very communicative throughout the process and gave updates on how the project was going throughout the process. She was engaged and showed she really cared about what we were envisioning from the beginning. 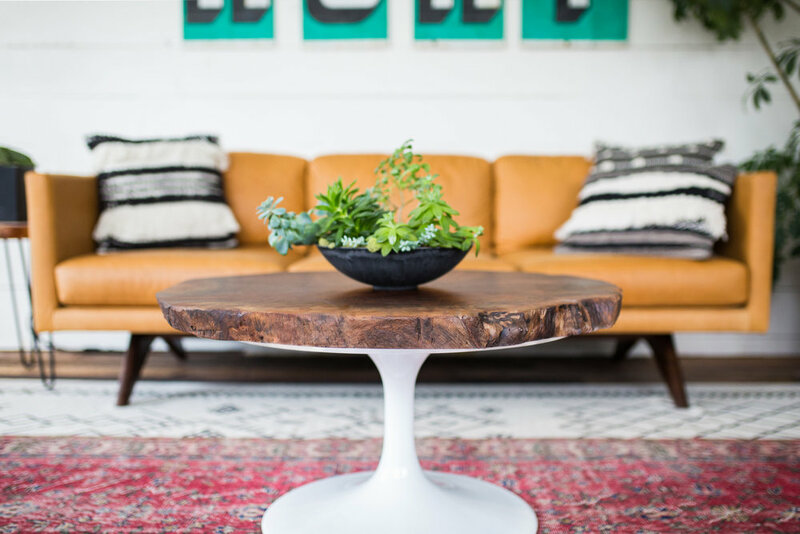 When Brianne delivered our end table tops, we couldn't have been happier with the outcome. What we had conveyed verbally was interpreted perfectly and translated to the end product."